Before my discovery of the Internet, television was one of my greatest escapes. I even worked in that “industry” for a decade or so. For those who have not worked in it, please take my word, it is nuttier in real life than it appears on the tube. But occasionally, there is a moment of sanity. A slice of solace. A bit of serenity; that is, a part of television that not only mocks the industry itself, but all authority and anything of arrogance. That something for me, in my young adulthood, was Monty Python’s Flying Circus. To me, John Cleese was a genius (and still is). In his prime, during this production of his show (and subsequent films), nobody could do it better. Even Lorne Michaels, producer of SNL gives Cleese and Monty Python credit for being “the trailblazer to the absurd. 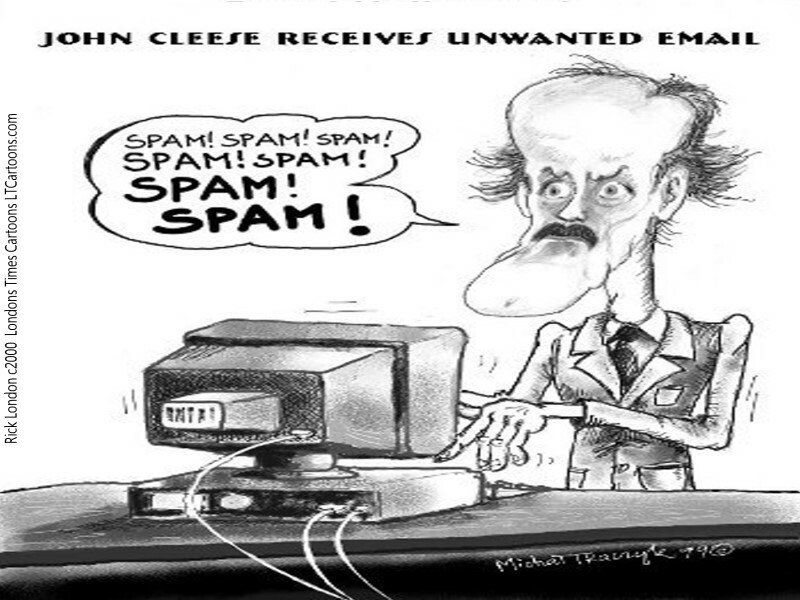 Perhaps one of Cleese’s most popular sketches (aside from dead parrots and wearing women’s clothes) was the Spam Spam Spam skit. And though his version was decidedly about the atrocious meat called spam, this cartoon attempts to take it a step further; predicting his behavior upon receiving unwanted email. Rick London is an author, songwriter, cartoonist and gift designer. He is best known for his Londons Times Offbeat Cartoons And Funny Gifts.